After the creation of the Svenska Aero AB (later renamed SAAB) , Carl Bücker returned in Germany in company of his chief designer Anders J. Anderson. This latter brought with him the complete set of drawings of a biplane aircraft. 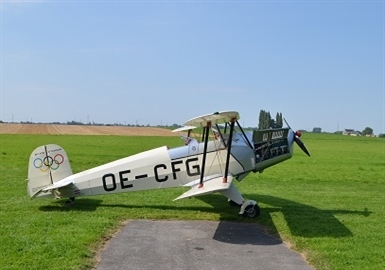 The Bücker Flugzeubau was established in 1932 and the biplane became the Bü-131 Jungmann. 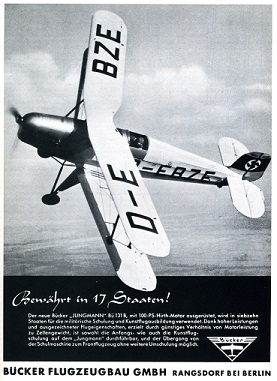 Its first important customer was the Deutscher Luftsportverband ( DVL) and, it was only after many export sales and successes at numerous international competitions that it was selected by the Luftwaffe as the primary basic trainer. Many others air forces ordered it and manufacturing for the licensed production was sold to Czechoslovakia, Japan, Switzerland and Spain. Its golden age in aerobatic competitions came when many were demobbed and modified with more powerful engines. It was only when aircrafts like the Pitts and the Zlin appeared that it had to be taken out of international competitions. Nevertheless, it remained a very appreciated aeroplane much sought-after. Today, you can buy a new one in Poland with Air Res and it exist an ultralight version with FK in Germany. The set of drawings sold to Tatra ( CZ) was found by Janusz Karasiewicz who founded his company Serwis Samolotow Historycznych ( SSH) in the nineties to restart the production. The Jungmann produced in Poland are named SSH T131 PA and powered with a LOM M332AK of 140cv that respect the original lines of the aircraft. ANORACK FACT : after WWII, Anders Anderson, returned in its homeland and designed the Safir for SAAB. OE-CFG is nr 115 built in 2002 and is usually based at Temploux. Status : private collection, in flying conditions.